If we ask you, what's the most important attribute you’d want to develop in your kid, most of you would probably rate intelligence on top. Well of course, everyone wants their kids to be bright and smart so that they can gain success in all walks of life. And this is the reason, parents take so much of pain just to ensure the kids get the right kind of schooling and education. However, as parents, you must make it a point to see that your child is getting the right kind of push to develop the intelligence level. Doing this isn't a task, all you simply need is, make your kids develop reading habits. Yes, you heard us right. Reading is one way to boost intelligence and learning power in kids. This is a habit to be practiced from an early stage, the sooner you start, the better it is. Emphasizing on the importance of reading in the development of kids, our honorable Prime Minister, Narendra Modi, too shared some valuable inputs. While addressing the students of the nation on the auspicious occasion of Teacher's Day i.e. September 5, our honorable PM urged students to develop regular reading habits. He said that education and degrees won't be of much use until the kids have the right skills. He asked kids to focus on their inner curiosity and keep up with it, all through their lives. He even advised them to read books so as to get inspiration, which will eventually help them in working towards building a brighter future. He told kids to read biographies, as they will take them close to their ancient history and make aware of the culture as well. He stressed on the fact that today it's more about getting information rather than knowledge, which, ideally shouldn't be the case. 1. An Exercise for Brain: Reading is one good exercise for the brain. The muscles in the brain tend to be very active while reading and the brain re-energizes itself. Whether your child reads a fiction or a non-fiction, the text passages help in building connections and further link the ideas, thereby promoting the brain activity. Reading helps the brain develop skills for logical thinking. It even strengthens the power to grasp hypothetical concepts, process fair judgment, and use logic and reasoning in distinct scenarios. Thus, you can make out how reading boosts the mental health. 2. Academic Excellence: Time and over, researches and studies have proved how reading habits contribute to a child's academic. A child who devotes time for reading, widens his stream of knowledge. His brain tends to be more active and thus helps the child in focusing on academics. With books being no more a subject of fear, kids fond of reading, work well with their course books too. 3. Widens the World of Knowledge: Reading is the best way your kids can get exposed to a wide number of ideas, new cultures, customs, traditions and beliefs. It's one method that widens the spheres of knowledge, helping the kids acquire in depth understanding of the world around. This will boost his confidence when he speaks to people regarding different subjects. 4. Increases Vocabulary and Armed Sentence Structure: Studying various genres of books and distinct writing styles apparently helps the kids come across loads of words. This builds their vocabulary skills and even strengthens their sentence structures. By reading various books, they understand how words are used and they'll slowly build a command over the language. Be it writing or speaking, they will be well-versed in both. 5. Improves Level of Concentration: Thanks to the digitization, where everything is available at a click, kids find it very hard to concentrate or focus on a thing for longer duration. To make sure your kid doesn't face the same trouble, inculcate reading habit in him without any delay. 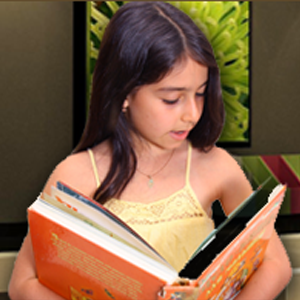 Reading helps the child to concentrate as the story binds him and seizes his attention. This in the long run helps his concentration power and allows him to focus on a particular subject for a long time. Make sure you provide him with a reading corner where he can read quietly without getting distracted. 6. Boosts Creativity and Imagination Power: Reading takes them into a completely different world. Irrespective of the genre they read, they are sure to wander in a different world of imagination while reading. This is because, our brain converts the texts so read into pictures. And as every individual is different, the picture thus made in the mind will also stand distinct. They feel attached to the characters of the book and even learn to empathize. 7. Improves Communication Skills: Reading and speaking go hand in hand. When you subject your kids to reading, they come across different ideas and concepts. This apparently helps them to build up their knowledge and they are in a better state to speak effectively about the topic they might have read. Exploring new words also helps in smooth communication. 8. Fun with learning: Books have been our best friends for ages. In the olden days, when there was no digitally equipped world, people looked up to books for entertainment. And they surely are the best source of entertainment. From comedy to drama, romance to action, from suspense to tragedy and the fantasies, you can have anything and everything in the world of books. Not to forget the immense knowledge one gains out of reading. So it's all fun with loads of learning. Always remember, the more your kids read, the more they understand; and the more they understand, the more they grow. Help your child grow, buy him a book now! !